Prokop Divis invented the grounded lighting rod which is still used in today’s modern infrastructures. He was also a natural scientist, theologian, and one of the Czech canon regulars during his time. A man of science from the earlier centuries, Prokop Divis thought ahead of his time and made this classic invention. Prokop Divis was born as Václav Divíšek on the 26th of March in 1698. He was born in Helvíkovice, Bohemia which is now known as Ústí nad Orlicí District of the Czech Republic. When he was a child, his initial studies began when he attended the Jesuit gymnasium in their town. In 1716, when Prokop was 18, he then entered a gymnasium run in Louka, in one of the Premonstratensian Order abbeys and there he completed his basic education in 1719. After he completed his basic education, Divis entered the novitiate of the abbey and he took the name Prokop or what is also known as “Procopius.” A year after his entry into the novitiate, he completed the probation period. Another year later, he professed the religious vows he had in the Order. Prokop then continued to improve his knowledge by studying both theology and philosophy while he was preparing for his ordination into priesthood. He was ordained in 1726. Three years later, he began to teach philosophy at that abbey’s gymnasium. He taught until 1735 and during this time, Prokop was instructed by his abbot to go to the Paris Lodron University, now known as the University of Salzburg. While he was there, he pursued advanced studies in the field of theology. He completed his doctoral dissertation and in 1733, obtaining his Doctor of Theology degree. After the completion of his degree, Prokop returned to the abbey and resumed monastic life becoming a canon regular. There, he served as the abbey’s sub-prior. In 1736, he was appointed as a pastor of one of the parishes in Prendice which is now a part of Znojmo in the Czech Republic. In his leisure time he studied the properties of fire and water (oxidation). He stayed in Prendice for five years until 1741 when he became prior of the Lukan Convent. He remained prior during the Austro-Prussian war and then resigned his duties and returned to Prendice. Although definitely a man who believed in God and serving the church, Prokop still made his own contribution as an inventor and scientist whose product is still being used today. He earned the needed experience to devise his invention when he was working in the parish in Prendice. Prokop was responsible for managing the Abbey’s farmland in Prendice. He also took charge of water conduit construction, which gave him the exposure he needed to understand mechanical issues. Prokop developed an interest in electricity and he began to perform his own experiments with great success on plant growth and therapy, using a small electric voltage. When the death of Georg Wilhelm Richmann, one of the professors at St. Petersburg, reached Prokop’s knowledge, he became interested in atmospheric electricity. Richmann had perished by being struck by lightning while observing a storm from a hut. This prompted Prokop to build what he called the “weather-machine” in Prendice, a device to protect from lightning strikes. Prokop devised the very first grounded lightning rod. He observed thunderstorms and deduced that lighting was an electrical spark. He also realized that he could imitate thunder and lightning on a smaller scale. One other important discover Prokop made was how metallic points can attract as well as discharge electricity faster than other materials. He discovered this during his initial trials for his grounded lighting rod. So much so was his success that he demonstrated his electrical experiments at Vienna’s Imperial Court in the presence of Emperor Francis Stephen and Empress Maria Theresa. Very much pleased, the imperial couple gave Prokop two heavy golden medals to show their appreciation of his work. His grounded lightning rod was first erected on 15th June in 1754, six years before Benjamin Franklin invented his lighting rod in the United States. Prokop’s lightening rod consisted of a pointed slender iron bar and fastened to it, near the top of the bar, were two cross bars, so producing four arms. Then across which, each in turn, a shorter bar was laid, making twelve ‘ends’. At each of the twelve extremities a box, with 27 brass needles was attached; each box filled with iron shavings. The main bar was supported by a 132 foot wooden column and iron chains connected the main bar to the ground. The rod was designed to split the lightening spark into as many sparks as there were needles (324) and so reduce its force. 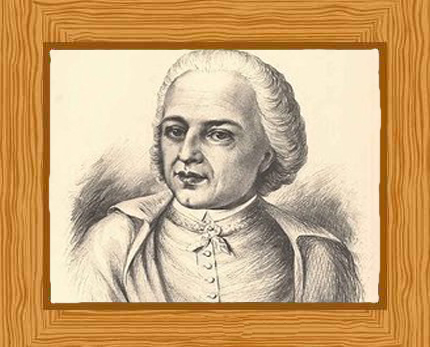 At the time his lightening rod invention was not popular and was received with suspicion, so Prokop removed it in 1756 and turned his interest towards music. His theory of atmospheric electricity was published from his papers after his death. Apart from his invention of the very first grounded lightning rod, Prokop also created the very first electrical musical instrument. This was called the denis d’or and was played by both the hand and the feet, like an organ. It was invented in 1753, and this instrument had properties which allowed it to imitate the sound of other string instruments. Initially, Prokop only studied science for the sake of being able to find the truth. But when he realized that he could utilize his findings, he made the most productive use of his scholarly knowledge. In 1765, Prokop died on the 21st of December in Prendice, aged 67.